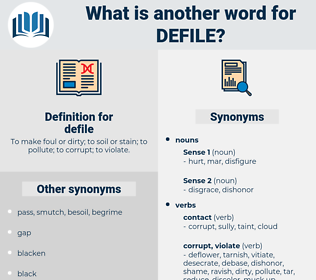 What is another word for defile? To make foul or dirty; to soil or stain; to pollute; to corrupt; to violate. cherish, shield, benefit, applaud, consider, care for, laud, tend, sustain, extol, vindicate, eulogize, conserve, regard, wash, Panegyrize, favor, uphold. disenchant, please, elevate, cure, cleanse, praise, heal, hallow, clease, purify, honor, turn off, upgrade, respect, assist, esteem, protect, help, sterilize, sanctify, clean. But why do they call this defile 'the Yellow Head Pass? Being determined that no one should approach the inn during the time we occupied it, our shock - headed friend had stationed one of his sons at the entrance of the defile, with definite instructions to bring the news to him with all speed should he detect the approach of any suspicious persons. davallia, devil lily, deep-yellow, deeply, dabble, diphylla, duple, double, dateable, dutiful, dapple, doubly, Debile, death valley, Deathblow, doable, dipole, devalue, deploy, dafla, dayfly, dutiable, datable, death bell, deed poll, data file, duffel, dibble, duffle, Douay Bible, devil, dphil, double-u. 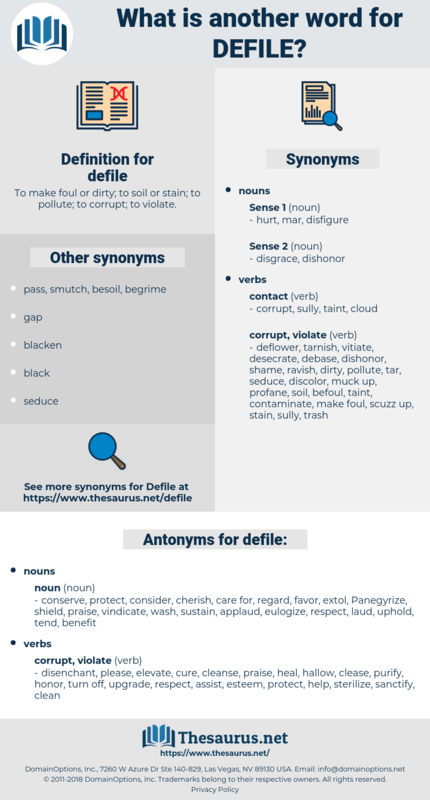 vitiate, spoil, impair, mar, deflower.